Alameda County Sheriff's Deputies are looking for a man who allegedly beat and robbed a 48-year-old woman in unincorporated San Leandro Friday night. 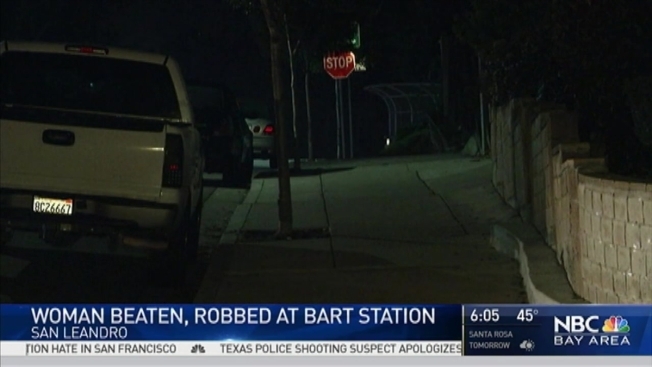 The victim was walking away from the San Leandro BART station around 8:15 p.m. when the suspect attacked her in the vicinity of Maubert and 159th avenues. He repeatedly struck her in the head with a blunt object, causing severe injuries to her face, before stealing her cellphone. Investigators believe he followed the victim for several blocks before the attack. The suspect was described as a black man with a thin build, roughly 5 feet 8 inches tall, wearing a blue jacket and jeans. Anyone with information about the attack is asked to call the sheriff's office at (510) 667-4401 or (510) 667-3605.